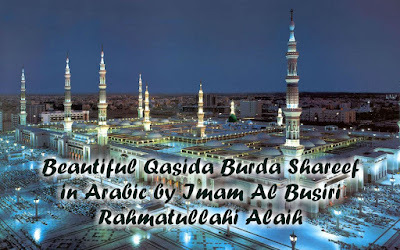 Qasida Burdah Shareef is written by Imam Sharafuddin Muhammad Al Busiri Ash Shadhili Rahmatullahi Alaih in the praise of Prophet Muhammad sallallahu alayhi wasallam. I had composed a number of praise poems for the Prophet, Allah bless Him and salute Him with peace, including one that was suggested to me by my friend Zayn al-Dīn Yʿaqūb b. al-Zubayr. Some time after that, I was stricken by fālij (stroke), an illness that paralyzed half of my body. I thought that I would compose this poem, and so I made supplications to the Prophet Muhammad, Allah bless Him and salute Him with peace, to intercede for me and (and ask God to) cure me. I repeatedly sang the poem, wept, prayed, and asked for intercession. Then I slept and in my dream, I saw the Prophet, Allah bless Him and salute Him with peace. He wiped my face with His blessed hands and covered me in His Mantle (Burdah). Then I woke up and found I was able to walk; so I got up and left my house. I had told no one about what had happened. 'Ala habeebika khayri khalqi kullihimi. Upon Your beloved, the best out of all of Creation. Wal fareeqayni min 'urbiw-wa min 'ajami. And the Guide of both the Arabs and the non-Arabs. Abarra fi qawli la minhu wa la na'ami. More true in word, saying "Yes" (meaning this is permitted) or "No" (meaning this is haram). Li kulli hawlim-minal ahwali muqutahimi. In (from) all the woes that have descended upon the humans. Mustamsi koona bi hablin ghayri munfasimi. Have held the rope of Allah so tight, that it would never break. Wa lam yudaanuhu fi 'ilmiw-wa la karami. None could reach his rank in knowledge (ilm) and in generosity (karam). Wa annahu khayru khalqillahi kullihimi.